Nuala Ní Dhomhnaill’s The Water Horse is a particular gem because of the collaboration of three great female Irish poets; Ní Dhomhnaill’s poems are in Irish, with English translations by Eiléan Ní Chuilleanáin and Medbh McGuckian. These poems present other convergences, particularly the mingling of mythology with modern life as in today’s poem, where we encounter the Persephone of Greek myth in current times. in his wow of a BMW. I couldn’t give him the push. the engine soared on wings. there’s not much light in the place. to all his stately homes. as a star on the silver screen. a veritable Céad Míle Fáilte of drops of blood. 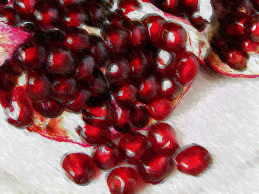 Ah, that pomegranate. There’s always a catch.